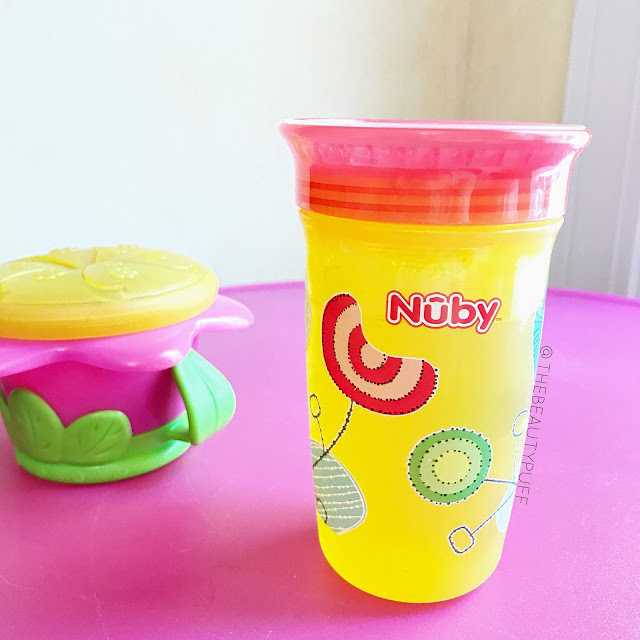 When my daughter stopped using bottles, I was honestly thrilled. Some may feel it's a bittersweet experience, but I said "Bring on the sippy cups!" 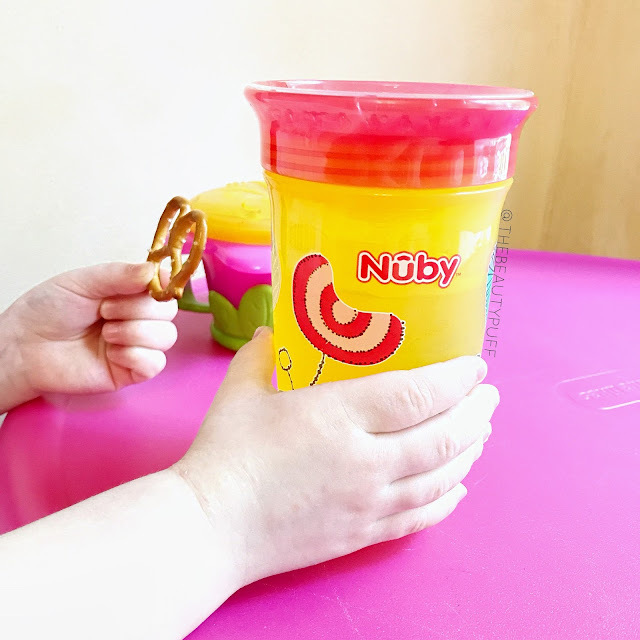 Nuby has always been a part of my daughter's journey from her first foods to her first cups. Our newest cup is the 360 Wonder Cup which bridges the gap between more juvenile sippy cups and a regular big kid cup. It comes in fun prints and styles your child will enjoy and an easy to wash, spill-proof design parents will enjoy even more. The lid of the cup is comprised of three pieces, the outer plastic rim, soft silicone rim, and a center piece that insures a secure fit. One thing I've found extremely helpful, is that when you go to take the cup apart, you can press the silicone piece from underneath to release, rather than gripping the outer rim. That can easily weaken the seal over time, leading to more spills and leaks. I've had other cups with that issue and they never lasted that long! This cup has withstood drops and countless drinks without leaking. I also love the bright, cheerful prints these cups come in. They have neutral prints as well as those suited to boys and girls. 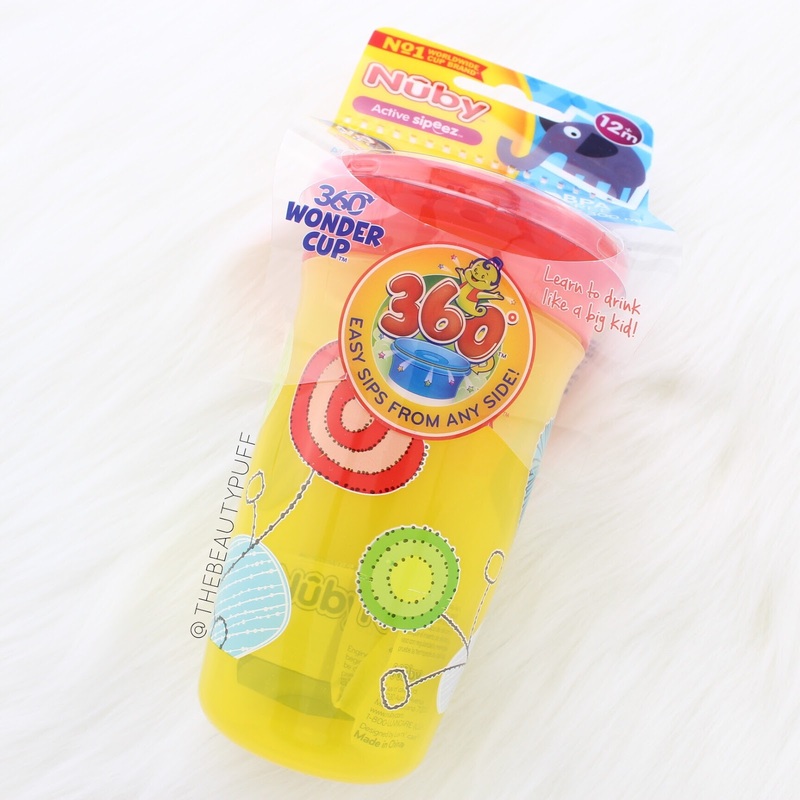 Along with its user-friendly design, the Nuby 360 Wonder Cup is also better for your little one's teeth, as opposed to standard sippy cups with spouts. The silicone rim is soft against gums, but still works wonders to prevent any liquid from spilling out of the cup. The Nuby 360 Wonder Cup holds 10 oz of fluid and is BPA free. Choose from six fun prints your little one will love! You can find this cup at Babies R Us, Kmart and Walmart.com below.